The Nature’s Co. Founder unveils beauty essentials at work! March being the financial year end calls for appraisal and promotion evaluations. Don’t you want to show the confiance inside out at this time of the year? We’re sure your desk drawers are fully supplied with pens and post-its, but what about beauty essentials? It’s important to keep an inventory of beauty must-haves at your workplace, after all, the amount of time we working ladies spend at our work desk, it makes it pretty much our second home. TNC doesn’t leave a chance to help you look your best naturally, around the clock. This time Beauty Expert & Founder, The Nature’s Co, Natasha Shah, herself has rounded up 6 products in the March Special Gorgeous 9 to 5 Beauty Wish Box, that’ll work as hard as you do. “Impromptu outdoor meetings or after-work plans, ‘freshening up’ or touch-ups become inevitable. These emergency fix-its have slowly filled up my desk, and I refuse to part with a single one, making me look and feel my best at all times. You’ll be ready for anything!” shares, Natasha. 1) Hydration: Keeping yourself hydrated keeps your body and mind active and fresh. Always have a bottle of water on your desk. Replace teas and coffees during work hours to green tea and lemongrass tea. 2) Moisturisation: Outdoor meeting and continuous air condition at work leads to skin dryness and damage. Treating your skin with the apt amount of moisture is necessary. Never skip your body lotion, day face cream, lip balm and hand cream quick retouches at work. 3) Quick Fixes: To freshen up anytime of the day a good face wash in your bag is a must have. When on the go wet wipes always help. 4) Grooming: Being well groomed helps to boost confidence level. Always keep a nail file, tweezers, an extra hair clutcher and hair ties handy to be looking perfect at any time. 5) Me – Time: Long hours in front of the computer screen causes a lot of strain to your back, neck and posture. Ensure you occasionally break into simple neck exercises and feet stretches to relax your muscles. *Personal Tip* : Take a break from the screen. Make sure you get up every hour for a few minutes and walk around your office. Avoid calling / emailing your colleagues, instead walk up to their desks, get up to get a drink, go near the window for some fresh air or get up to get your print or photocopy. 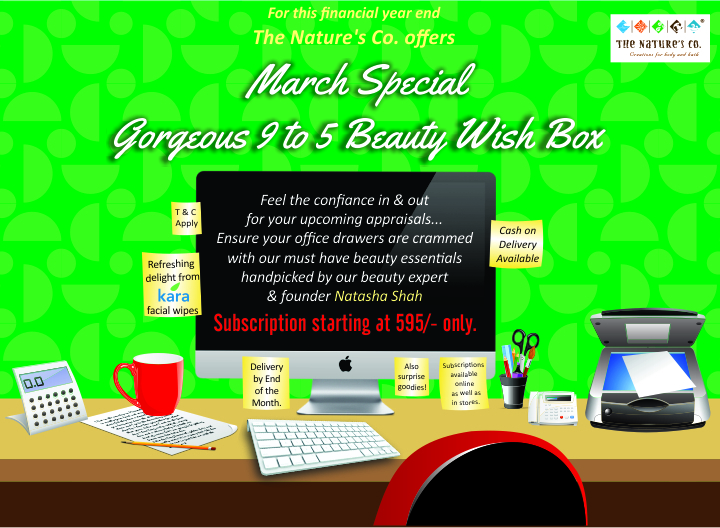 Find the handpicked recommendation in our March Special Gorgeous 9 – to – 5 Beauty Wish Box. Subscriptions start at Rs. 595/- only. Also get 35% Discount Vouchers on full sized products on subscription to sample size. A complimentary spa coupon at TNC stores, and a special refreshing delight from Kara facial wipes. « Looking for a scissor-free solution to split ends?